We’ve just posted online the final issue of ONE for 2012. Check it out here. Features include a look at Ethiopia’s thriving Catholic school system; a glimpse at life among the “untouchables,” the Christian Dalits of India; analysis of “Communion and Witness,” the apostolic exhortation to the churches of the Middle East; and the conclusion of Michael J.L. La Civita’s seven-year-long series profiling the Eastern churches. His series was a massive undertaking, and one of the most ambitious in the history of the magazine. He talks about it in the video below. We’ll see you in the new year! Until then, a blessed Christmas to all of you, from all of us at CNEWA! The only way you can get an authentic Racine Danish Kringle is if you are in Racine, Wisconsin. Or if you happen to know an extra-generous Racinian who wants to mail one to you. Luckily, I meet extra-generous people every day through my job in the development office of CNEWA—and that helped bring a Kringle into my life this week! Here is the background: Allen Buhler was a successful entrepreneur who was also a benefactor of CNEWA. He had a special concern for the Christians of the Holy Land and the humanitarian works of their churches. (We reported on his generosity in the pages of our magazine, and how he gave a grant to a medical clinic that now bears his daughter’s name.) Allen was called home to God last year, and his family wanted to honor his love for the poor and the churches that CNEWA serves. I visited them in the fall to discuss ways to keep his legacy alive through CNEWA. Somehow, we got to talking about Cardinal Timothy Dolan and Kringles. It turns out the Buhlers know the chair of ourboard from his days as archbishop in Milwaukee — and they also know that he loves Kringles. I had never even heard of Kringles. But the Buhlers told me that I simply had to try one. And if I couldn’t find my way to the bakery, well, they’d get one to me somehow. Well, guess what came in the mail this week. Not one, but two Kringles! We sent one to Cardinal Dolan—a little Christmas present from the Buhlers and us—and saved the other to share with the rest of the CNEWA staff, including Msgr. Kozar, who savored a slice before heading out the door for a trip to the Holy Land, where he’ll celebrate Christmas Mass in Bethlehem. And, in case you’re wondering: yes, the Kringle was worth the wait (and, um, the weight...we all start our diet in January...!) Curious? Check out the bakery’s website. I hope you have a sweet and merry Christmas! A woman walks past a house destroyed in an airstrike in Azaz, Syria, on 18 December. Syrian Christians prepare for somber Christmas (Canada Free Press) “Silent night, Holy night, all is calm, all is bright...” Many Christians all over the world will sing this Christmas carol in the next few days. Millions look forward to Christmas. What about the Syrian Christians in the midst of a terrible civil war? Will they have the “heavenly peace” this Christmas classic speaks about? His Eminence, the Metropolitan Archbishop of Western and Central Europe, has been elected Patriarch of the Great City-of-God Antioch and all the East. The Patriarch-elect Youhanna X [Yaziji] was elected by the members of the Holy Synod earlier today, 17 December 2012, during a special session held at the Balamand Patriarchal Monastery of the Dormition of the Most Holy Theotokos. Born in Syria in 1955, the Patriarch-elect received his primary, secondary and university education in Latakiya, Syria graduating with a degree in civil engineering. He earned a degree in theology in 1978 from the Saint John of Damascus School of Orthodox of Theology at the Balamand University and a doctorate in theology (emphases in liturgy and Byzantine music) in 1983 from the Aristotle University of Thessaloniki in Greece. He was tonsured a monk at the Athonite Monastery of Saint Paul on the Holy Mountain, was ordained to the holy diaconate in 1979 and to the holy priesthood in 1983, and in 1981 became professor of Liturgical Studies at the Saint John of Damascus School of Orthodox Theology at the Balamand University. He assumed the position of dean of that theological school from 1988-1991 and again from 2001-2005. He was elected and consecrated to the sacred episcopacy in 1995 with the title Bishop of al-Hosn. He has served as superior of the Monastery of Saint George al-Humayrah in the Christian Valley (Wadi al-Nasara) in Syria, superior of the Our Lady of Balamand Monastery, and spiritual father to the Convent of the Dormition in Blemmana, Syria. In 2008 he was elected and enthroned as the Metropolitan of the Archdiocese of Western and Central Europe. In its heyday, the monastery was one of the region’s major theological centers. Scores of monks once lived, prayed, studied and worked there, and its seminary trained the region’s priests. But dwindling enrollment forced the monastery to close its doors not long ago. Father Andrew, a priest in the nearby village of Amre, studied at St. George’s. “We are sad that St. George’s is no longer a seminary,” says the priest, adding, “there is talk to start it up again. There is a convent in the nearby village of Marmarita, where students can study theology for three years and then go on to Lebanon to finish their studies.” But only three monks remain at St. George’s, which has become a favorite stop for bus loads of pilgrims and tourists. “We get up at 5 a.m. to pray in the chapel and then do various chores like cleaning or working in the library, until breakfast at 8:30,” says Mar Christo, the monastery’s energetic abbot. Cloaked in his traditional black cassock, his woolly hat outlining his pointed beard and laughing eyes, he says that soon after breakfast, “the tourist buses start to arrive, so we show them around. 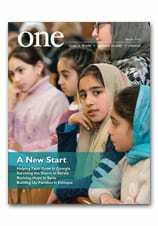 Read more about Syria’s Christian valley in the January 2011 issue of ONE. A Christmas tree decorates St. Peter’s Square after a lighting ceremony at the Vatican on 14 December. The 78-foot silver fir tree is from the Italian province of Isernia. In a scene from the Hindi film “Christaayan,” Jesus is shown teaching the people. “Christaaya”, the first Hindi production about Jesus, has been presented to the public. Situated in India, it is inspired by the country’s traditional culture. The six-hour epic was produced by Satprakashan Sanchar Kendra in Indore for the Divine Verb Society and will be broadcast nation-wide as a TV series. Directed by Fr Geo George, the movie was shot over a seven-year period in several states, including Tamil Nadu, Goa and Kerala, with the participation of more than 200 actors, almost all amateurs. The presentation was held at the Miriam School in Indore, a school for the mentally disabled. The movie presents actors dressed in saris of different colours within a context representative of the Indian tradition. What is more, 80 per cent of the actors are not Christian. For example, Ankit Sharma, who plays Jesus, is a Hindu. And check out the movie’s trailer, below.